What is Time Abundance and How Can I Have it? What is time abundance? It is a mindset, like anything else. When we live with confidence and trust that we have more than enough time to fulfill our ultimate purpose, we are living in a time-abundant state. Consider the alternative: time starvation. Most of us live there most of the time. Imagine a world in which having time meant success. My Friday gift to you is my hour-long chat about slow living with UK-based Career Coach Ros Toynbee. She asks questions such as what is time abundance and how can I have it? If you don’t have an hour, take a listen for even ten minutes. May it uplift you as you enter your weekend! Books are a divine expression of our innermost worlds. I revere books like some people do churches. In fact, libraries are my sanctuary. You know the saying, Everyone has a book in them? Well, it’s time you pulled yours out into wide open spaces. On December 4, 2009 at 9 am PT/12 pm ET, you will have the opportunity to learn more about how to write a book to make New York publishers smile. I am joining forces with Get-it-Done Guy Stever Robbins, author of the forthcoming The Get-it-Done Guy’s Nine Steps to Work Less and Do More and Michael Neill, best-selling author of Feel Happy Now! and You Can Have What You Want, to discuss how we wrote our books and how to promote them. From book proposal to bookshelf occupant, take it from the pros in this lively, interactive teleclass! Interested? Register here for details. And you better believe it’s free. We want more books to delve into. Why not have it be yours? 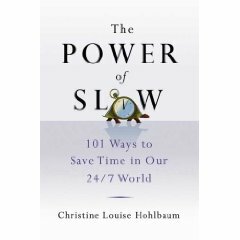 At 7 am PT/9 am ET on December 4, 2009, I’ll be chatting with Loren Gelberg-Goff on her radio show Loving the Life You’re In about the power of slow and how to live its principles every day for a more fulfilling, joyous life of time abundance. Please listen in either live or in the archives. I welcome your feedback! Rituals are a part of our existence. Whether it is turkey at Thanksgiving or wearing red around the holidays, we all observe some type of ritual in our lives. Recently, I developed a new ritual to take care of those things that get misplaced that would otherwise drive me into a tizzy as I upend the entire house to find them. I engage in a ritual of letting go. It’s a Blessing Way of sorts to the item that’s gone missing. You may have read about my lost cell phone that showed up a week later in my eye glass case. It was as if the Universe were telling me to see with different eyes. After my initial shock, I blessed the missing cell phone and thanked it for having been in my life. Then I released it to the ethers with full acceptance that it’s journey with me had ended. My daughter didn’t quite believe the effectiveness of this ritual until she came home one day with a long face. She had misplaced her new jacket that she loved dearly. “Do the slow release,” I advised her with a motherly grin. For once, she actually stopped herself from rolling her eyes. “I release you to the Universe. Thank you, jacket!” And, of course, a few days later she came back with it in hand. She had left it in the science lab. By some miracle (or perhaps it had been her blessing? ), no one had taken it. The slow release says things are just as they should be. So if you’re stridently looking for those missing keys, try saying a gratitude prayer instead. Chances are they’ll resurface the moment you let go of how things should be. We may bemoan the treacheries and time-sucking nature of the Internet, but it sure has introduced me to some of the most fascinating people on the planet. When used mindfully, the Internet offers buckets of useful (and not so useful) information. With technological advances such as web-based video calls (aka Skype), twitter and Facebook, we have raised our awareness of how entangled we all are with one another. In a way, the World Wide Web has increased our consciousness of oneness. I stumbled upon…ummm… I digged…nope. Let me start again. I met a fascinating performance consultant by the name of Mark K. Petruzzi on twitter. the other day. He tweeted about me. I tweeted about him. And before you knew it, we were Skyping about God, spirit and work-life solutions. Life can be that grand. 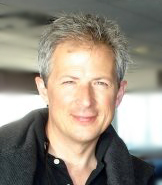 With more than 15 years in corporate training with IBM, CIGNA Corporation, and General Physics Corporation, Mark has spent over three decades in the study of expansive inner life practice and 25 years in the study of enhancing job satisfaction through employee self-actualization. In short, he takes a “personal value” approach to work. Ten minutes with Mark will tell you he enjoys working with individuals and small groups, in business or private settings, as he helps them enhance both their personal and work lives. Curious about his view of time starvation, I tossed out a few questions to get a sense of his relationship with time. “If you feel a paucity of time,” he told me, “you literally are compressing it. We have to start trusting others and ourselves more. We need to know our lives will work out. Our point of power is in the now. If you give in to fifty distractions at every moment, you aren’t really living.” You are, in effect, merely breathing. And that rather breathlessly! The basis of his work, like the basis of mine, is choice. When we live in a mindful state, we reclaim our personal power. We talked about the nobility of pain and how we might very well be addicted to the ways in which we maltreat ourselves. If you run about being so ‘busy’, you might really be missing the whole point. Allowing our ego the space to dwell within us is a great first step toward diffusing its power over us. Mark refutes the notion of the ego being ‘all bad’. Like a houseplant, it needs care and feeding like the rest of our being. I tend to acknowledge its cry so it doesn’t get louder (any parent of an infant will tell you that’s the best thing to do, especially in the middle of the night!). Loving the ego fosters compassion for ourselves and others. On the road to time abundance, we need to recognize there is more to us than what we do, own or look like (Mark says I look like Laura Linney. Now, if I could only act like she does!). We are whole beings. When we are one with time, we can wrap ourselves in it like kings’ robes. You might even call it time-swathing. Mark offers Inner Life Practice* workshops including Choice-Level Living, Choosing to Stress Less in a Stress More World, and Bringing Your Spirit to Work. He is currently writing The Desire Engine, a book about reclaiming our personal authority, and developing an inner life practice that fuels our internal “engine” of expansion and purpose fulfillment. I’ll be the first in line to buy his book. May the spirit of time abundance, and the miracles of everyday living, give you the oxygen to breathe more fully this day and always! *If you’d like to connect with Mark, he suggests you check him out on Twitter @INrLifePractice. You can also find out more about him at http://bit.ly/enlightened. Have you ever noticed how we talk about time? We often address it like a fierce competitor we have to beat to the finish line. We crunch it, beat it, and race against it. But I wonder what would happen if we were to treat time as a partner, as a friend, as the Siamese twin it was meant to be? In my book, time equals existence, not money as Benjamin Franklin was apt to say. Let me back up. Time, in truth, is a construct. It is an organizing principle that helps us meet expectations, such as getting to the same restaurant at the same moment as your friend so you can have lunch. It is a useful tool in commerce, too. You wouldn’t want to miss that shipment coming in from abroad, now would you? In fact, global time wasn’t properly introduced until October 13, 1884 when a few folks from 26 nations gathered in Washington, DC to agree upon the prime meridian that sliced through the Greenwich Observatory’s telescope in England. In that agreement, the Earth was placed into a girdle with 24 strands. We call them time zones. For anyone who’s suffered jet lag, as I just have after a two-week trip to the US, you’ll know the effect time change can have on you. So if time is something we’ve made up, why do we engage in clock combat, that insidious striving to beat that which we cannot control? We often attempt to cram so much into our day that we are left breathless even trying to ‘keep up.’ But, what exactly are we keeping up with? My guess it is an imaginary standard as made-up as time itself. I would claim multitasking is symptomatic of a much broader issue. We attempt to do two or more comparably difficult things at once (texting while driving comes to mind) because we think we don’t have enough time. Truth be told, we are living longer than we ever have in human history. With an current average life expectancy of 78.11 years in the United States, we have a lot more time than we used to. Time as friend? Now there’s a thought. What would your life look like if you embraced a time abundant mentality? Here’s a fun task to try. The next time you are going somewhere and you think you might be late, turn off all distractions (radio, cell phone, iPod, etc) and simply concentrate on where you are going while observing the speed limit. Breathe deeply as you do and tell yourself “I will get there at the exact moment I need to.” Chances are you will arrive in a state of bliss. Even if you are a few moments late according to the clock, you will have lived one of the basic priniciples of the power of slow ~ mindful living while being fully engaged in the here and now. So go for it. Then tell me how you did! Original post from Psychology Today. Last night’s event at the mid-Manhattan branch of the New York Public Library was an incredibly humbling experience. People from China, the Ukraine, France, Puerto Rico, Latin America and North America assembled to talk about time abundance. Since several audience members had heard my speech the week prior at the National Arts Club of New York, I varied some of it to make it interesting. Eighty people showed up. I was astounded at the level of interest and the yearning for permission to slow down in this 24/7 world of ours. Young and old, foreigners and citizens gathered together in the most extraordinary way. This week has been one of the most rewarding experiences of my life. May we all embrace the slow and in doing so realize how connected we truly are.